If you've not heard of Lavish Alice yet, I suggest you get onto their website straight away! It's packed to the brim with pretty lace dresses, sheer collared shirts and gorgeous prints, a girly girls paradise. I am in love with the mint green shirt. It's a beautiful take on the collar tip trend, with lace detailing instead of the metal, perfect for spring and summer. The dress ticks so many boxes for me too; nipped in at the waist, floral, cut-out and collared, would definitely look cute with a denim jacket and bare legs when the English summer eventually emerges. The striped body is something different for me, I'd see myself teaming it up with my AA Disco Pants or my H&M pleated leather skirt on a night out. Printed denim is big this season, and my love for floral instantly attracted me to these jeans. The colours are muted, so a great way of working the trend if you're a little scared of patterns. I'd pair these with a simple white tee and let the trousers do all of the talking. Finally, the dipped hem skirt. I adore this shape and have found myself wearing it a lot. The colour is stunning too, coral is perfect for summer and instantly makes your skin look a little more tan. 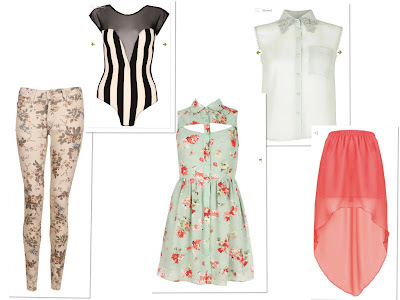 As if the clothing wasn't gorgeous enough, all of these items are less than £40! Bargainous. Thank you, I think I might have to make a cheeky purchase of it. And no worries lovely!